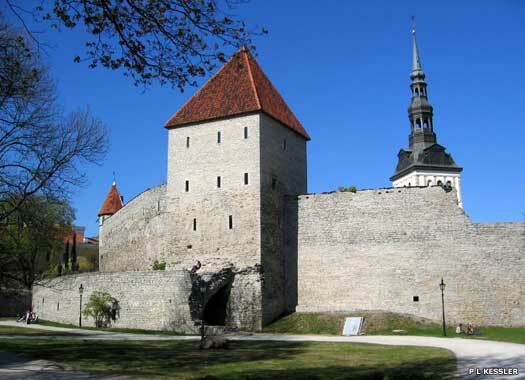 The Danish conquest of 'Lindanisse' (modern Tallinn) in North Estonia was complete in 1219. The city was named Reval by the Danes, after the name of the province in which the city lay, Revelia, or Rävala (it later became known as Tallinn, probably meaning 'Danish city', although the source is disputed). The king appointed a vice-regent in Tallinn to govern in his name, and contrary to the law of the Catholic church he also reserved the right to appoint the bishops of Reval himself. This formed a unique situation in Catholic Europe, and one which was hotly disputed by the Pope and by various bishops, but to no effect. The royal right to select the bishop of Reval was maintained, and was even included in the treaty signed when North Estonia was sold to the Livonian Knights in 1346. Until 1374 the bishopric of Reval fell under the jurisdiction of the archbishop of Lund in Denmark (now in Sweden). It was the Danes who founded the city's oldest churches, including St Mary's Episcopal Dome Church, St Nicholas Church, the Church of the Holy Ghost, and St Olaf's Church, all of which still survive. The Danes are temporarily eclipsed in North Estonia when the Livonian Knights conquer all of their territory from the heartland of their powerbase in central Livonia. In 1238, North Estonia (Harria and Vironia) is returned under the terms of the Treaty of Stensby, which is mediated by the Pope. The role of the Estonian elders on Ösel-Wiek is effectively terminated when that island is finally conquered. Ösel-Wiek is established as one of four bishoprics in Livonia. The territory is divided between the archbishop of Riga, the Livonian Knights, and the city of Riga. Over the course of the next few years, the city of Riga loses its domain and the island remains under the governance of two landlords - the bishop of Saare-Lääne (Ösel-Wiek) and the Livonian Order. The Livonian Knights, along with the Teutonic Knights, are abandoned by their Estonian and Couronian vassals and defeated severely at the Battle of Durbe in Livonia by the Samogitians. As a result, numerous rebellions break out against the Teutonic Knights all across the Baltics, including military expeditions by the Lithuanians, and it takes around thirty years before complete control is regained. Allowed to retain his position by the Teutonic Knights. The St George's Day Uprising sees a large-scale Estonian revolt beaten by the Livonian Knights, using a mixture of treachery and battle. Probably as a result of this, just three years later, the Danish king sells North Estonia to the Livonian Knights for ten thousand marks. All of Estonia is now ruled by a German nobility class. Following the purchase of North Estonia by the Livonian Knights, their superiors, the Teutonic Knights held overall authority for the bishopric. The official transfer of power took place on 1 November 1346, although the incumbent bishop was allowed to remain in place. Also known as Ludovicus de Monasterio. Bishop Heinrich consecrates the newly-completed Pirita Convent for the Order of St Bridget in Tallinn, conducting the ceremony on 15 August. 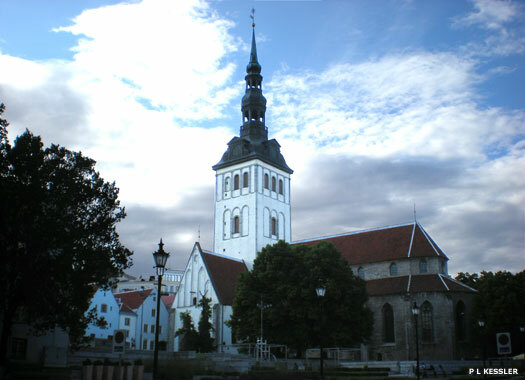 The rebuilt St Olaf's Church in the lower town of Tallinn is opened. With its new spire it is the world's tallest building for the next two centuries. Became bishop of Dorpat (1518), and archbishop of Riga (1524). The German Lutheran reformation reaches Tallinn, accompanied by a surprisingly violent stripping of the churches. The violence starts at St Olaf's Church, but the stronghold church of St Nicholas successfully fends off its attackers. A similar mood of destructive reformation occurs in the capital city of the bishopric of Dorpat. A devastating fire rips through Reval, destroying the largest church in the city, the Church of St Catherine of Alexandria, along with the attached Dominican friary. The death of the priest in charge of the Swedish St Michael's Lutheran Church is also recorded in this year. Following Russian provocation and the conquest of Dorpat, the Livonian Wars erupt in the Baltic States (1558-1583). The last German bishop sells the castle and the town of Kuressaare to the Danes, who also take Courland, both of which are held by Magnus, duke of Holstein in Denmark. Magus then adds Reval to his list of possessions. Bishop of Courland and Ösel. Titular 'king of Livonia'. Magnus holds the position as one of many, but his attempt to gain control of Toompea Castle in Reval is prevented by Gotthard Kettler, last grand master of the Livonian Knights. A further attempt to secure Reval, this time from the Swedes, fails in 1571, and the bishopric is effectively extinguished. Reval becomes the capital city of Swedish Estonia.